The USS ANCHORAGE (LSD-36), the first of the Anchorage-class dock landing ships, was commissioned on 15 MAR 1969. Built by Ingalls Shipbuilding in Pascagoula, Mississippi, USS ANCHORAGE was assigned to the Pacific Fleet Amphibious forces and began her service life with deployments to the Western Pacific and the waters of Vietnam. ANCHORAGE's final Vietnam deployment was to assist in the evacuation of Saigon - Operation Frequent Wind. The routine of state side training and maintenance, then "West Pac" cruise continued through out her career. After the the Iranian Hostage Crisis of 1979-80, The Indian Ocean became a destination for ANCHORAGE. USS ANCHORAGE served her country for 34 years, 6 months and 16 days, until decommissioned on 1 OCT 2003. After being laid up in the Reserve Fleet for seven years, ANCHORAGE was sunk by US Patrol Squadrons VP-5 and VP-40 on July 17 with Harpoon and Maverick missiles off of Hawaii. Anchorage (LSD-36) was laid down on 13 March 1967 at Pascagoula Miss. by the Ingalls Shipbuilding Corp.; launched on 5 May 1968; sponsored by Mrs. Alexander S. Heyward Jr. the wife of Vice Admiral Heyward; and commissioned at the Norfolk Naval Shipyard Portsmouth Va. on 15 March 1969 Capt. Percy Stuart Beaman in command. After a brief round-trip cruise to Andros Island Bahamas the dock landing ship left Norfolk on 24 June bound for the west coast. She paused at Mayport and Fort Lauderdale Fla. transited the Panama Canal on 16 July; and arrived at her home port San Diego Calif. on 26 July. At the end of shakedown training off the California coast she entered the Mare Island Naval Shipyard Vallejo Calif. on 1 November for post-shakedown availability. Anchorage returned to San Diego on 9 January 1970. She set sail on the 31st for the western Pacific (WestPac) to transport Marine Corps personnel back to the United States as part of Operation "Keystone Bluejay " a planned withdrawal of American troops from Vietnam. On 19 February the ship arrived at Danang Republic of Vietnam took on board the personnel and equipment of the 7th Motor Battalion and sailed for the lJnited States. She reached Delmar Calif on 12 March and debarked her passengers. Following a month and one-half in port at San Diego for training and upkeep Anchorage got underway on 1 May with other units of Amphibious Squadron (PhibRon) 5 for the Far East. She stopped at Pearl Harbor and then sailed to Johnston Atoll to deliver several landing craft. The ship next proceeded to Yokosuka Japan and arrived there on 19 May for voyage repairs. Her next port call was at Buckner Bay Okinawa where marines came on board for transportation to Subic Bay Philippines. Upon the completion of that embarkation PhibRon 5 units assumed duty as Amphibious Ready Group (ARG) Alfa. >From 6 to 18 June Anchorage carried small craft between ports along the coast of Vietnam. Her ports of call included Vung Tau Camranh Bay Qui Nhon Danang and An Thoi. She anchored near An Thoi from 11 to 14 June to provide drydock services for the ships at the naval activity there. On 22 June the ship participated in the first of several amphibious exercises conducted by ARG Alfa at Green Beach near Hubic Bay. During these operations she acted as a primary control ship for the direction and control of landing craft while they moved to the beach. The ship pulled into Sasebo Japan early in July for a period of rest and relaxation for the crew. She got underway again on 16 July for amphibious exercises off Green Beach. On the 31st she arrived at Okinawa to take Battalion Landing Team 2/9 on board for transportation to Subic Bay. Anchorage arrived at Subic Bay on 18 August for upkeep. Her next port of call was Hong Kong which she visited from 10 until 18 September and then returned to the Subic Bay operating area. 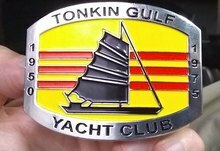 >From 24 September through 8 October Anchorage traveled among Subic Bay and Vung Tau Camranh Bay and Danang Vietnam carrying various small craft. Late in October she carried out relief operations in the Lagonoy Gulf on the eastern coast of the Philippines for victims of Typhoons Joan and Kate. After touching at Keelung Taiwan on 29 October the ship proceeded to Okinawa to pick up a landing craft for transportation to Subic Bay. She took part in amphibious exercises at Green Beach on 7 November then put into port at Subic Bay. From the 20th to the 23d Anchorage was at Okinawa to disembark marines and to unload their equipment. During this time PhibRon 5 was relieved of duties as ARG Alfa. The ship then paid a short visit to Yokosuka Japan for liberty and the loading of equipment for transportation to the United States. Sailing from Japan on 30 November the vessel arrived in San Diego on 10 December. Anchorage remained in availability until 20 February 1971 when she got underway for Port Hueneme Calif. There she loaded construction materials for a communications center on the island in the Indian Ocean Diego Garcia to be built as a part of Operation "Reindeer Station. " She left the California coast on 22 February bound for Australia. The vessel made port calls at Sydney and Perth Australia late in March and then pushed on into the Indian Ocean. Upon arriving at Diego Garcia on 4 April she unloaded the construction materials and sailed the next day for Subic Bay to obtain minor repairs and replenishment. Following a visit to Hong Kong from 17 to 22 April the ship sailed to Danang where she embarked Marine Corps personnel and equipment for return to the Umted States as part of Operation "Keystone Robin." On 23 April she shaped a course for San Diego. Anchorage arrived in her home port on 11 May and on 28 June resumed operations as a training ship for landing exercises off Seal Beach Calif. This study was followed by refresher training and a period inport at San Diego. From 2 to 6 August the vessel was again involved in exercises off Seal Beach. She left San Diego on 16 August to sail to her namesake city Anchorage Alaska where she remained from 22 to 26 August. After pausing at Alameda Calif. to unload aircraft she arrived back at San Diego on 1 September and entered upkeep. The ship sailed for Hawaii on 1 October and en route participated in Convoy Exercise 3-71. She spent two days at Pearl Harbor before continuing on to Buckner Bay Okinawa. There she rejoined ARG Alfa and embarked marines for transportation to Subic Bay. Early in November the ship visited Kaohsiung Taiwan. From 13 to 20 November she shuttled landing craft between Vung Tau and Subic Bay. During the last few weeks of 1971 the ship visited Sasebo Japan and Hong Kong for liberty calls and also carried marines and equipment from Okinawa to Sublc Bay. After a period of repair work Anchorage sailed for Buckner Bay on 17 January 1972 to embark marines for transportation back to Subic Bay. Late in January she carried out wet-well operations at Danang Qui Nhon and Vung Tau and in mid-February traveled to Singapore for a visit before returning to Subic Bay. After a brief trip to Kure Japan in early March the ship was involved in amphibious exercises. On 31 March she got underway to rendezvous with Task Group 76.5 which she met on 2 April for operations off the coast of Vietnam through 6 May. The ship was at Subic Bay from 9 to 18 May and then sailed back to Vietnamese waters for wet-well lifts to Vung Tau Hoi An and Danang. On 24 May she took part in Exercise "Song Thanh 6-72." She reached Okinawa on 14 June to embark troops bound for the Philippines and arrived at Subic Bay on the 20th. After a series of amphibious landing exercises Anchorage resumed wet-well operations between Vung Tau and Subic Bay. The vessel visited Kaohsiung in early July then arrived back at Subic Bay on the 8th. She left the Philippines bound for home on 9 July and made San Diego on 24 July. She remained in port through 4 December when the vessel got underway for independent type exercises off the southern California coast. She returned to San Diego on the 7th and entered a holiday leave and upkeep status. After local operations Anchorage traveled to Seal Beach late in January 1973 to unload her ammunition. She returned to San Diego on 1 February and began overhaul there on the 19th. During this yard work a fire broke out on board and prolonged her stay in overhaul. The ship finally got underway on 23 September for sea trials and started refresher amphibious training late in October. On 8 December the vessel commenced another WestPac deployment. During the cruise the ship visited Subic Bay Buckner Bay Sasebo and Iwakuni Japan Diego Garcia and Singapore. While off Korea Anchorage joined ARG Bravo for Operation "Fly Away." Leaving Subic Bay on 28 March 1974 she made stops at Guam and Pearl Harbor before arriving back in San Diego on 18 April and entering a standdown period which lasted through 29 July. On that day the ship sailed northward to carry out a survey mission of potential amphibious training areas in Alaska. During her cruise embarked scientists surveyed 10 possible landing sites and the vessel visited in Seattle Wash. Nanaimo British Columbia; and Sitka and Anchorage Alaska before reaching San Diego again on 5 September. Anchorage began a restricted availability at Long Beach Calif on 17 October and after the work was completed on 16 December she returned to home port for the holidays. On 6 January 1975 the ship began two weeks of amphibious refresher training off the southern California coast. She then participated in Operation "Bedstream" with other ships of PhibRon 5. After a period of upkeep in San Diego Anchorage again sailed for the Orient on 28 March. She carried marines and their equipment for participation in Operation "Frequent Wind" off the South Vietnamese coast. The ship reached Vietnamese waters on 30 April and provided material support to ships evacuating Vietnamese refugees. On 2 May she left the Vung Tau holding area with the other ships involved in Operation "Frequent Wind." On 13 May her scheduled operations were interrupted by the Mayaguez incident. Anchorage was ordered to proceed south to provide support as needed for the rescue of Mayaguez. Following the ship's rescue Anchorage resumed her original schedule which included upkeep in Sasebo Japan a visit to Keelung Taiwan and a port call to Inchon Republic of Korea. Early September brought her a liberty call at Hong Kong. She then proceeded to Yokosuka for upkeep. Following stops at Keelung and Buckner Bay Anchorage sailed from Okinawa on 28 October to return to her home port. En route she participated in Operation "Polymode" before arriving at San Diego on 16 November for upkeep and local operations through the end of the year. During the first three and one-half months of 1976 the dock landing ship continued local operations off the southern California coast. From 26 April through 17 June she was in restricted availability in preparation for a bicentennial visit to Alaska. However that trip was cancelled and the ship was inport at San Diego from mid-August through December undergoing repairs. Tests and inspections occupied Anchorage during the first two and one-half months of 1977 before another WestPac deployment began on 28 March. She stopped briefly at Pearl Harbor then pushed on to Eniwetok to unload cargo and vehicles. During her cruise the ship served as a member of ARG Alfa. She also visited Guam; Subic Bay and Iloilo Philippines; Singapore; Hong Kong; Keelung and Yokosuka. Among the amphibious exercises in which she participated was Operation "Fortress Lightning " held in the Philippines in waters near Santa Cruz Mindanao Island from 10 to 23 October. Upon the conclusion of this exercise the vessel made her way back to the west coast of the United States via Okinawa Guam and Hawaii. On 17 November she pulled into San Diego and spent the rest of the year in upkeep. The ship was involved in training operations along the California coast in January 1978. On 20 February she got underway for Bremerton Wash. to carry Army troops to their home base. The ship arrived at San Diego on 3 March and began preparations for overhaul. She got underway in tow of Abnali (ATF-96) for the Long Beach Naval Shipyard on 14 April and commenced a regular overhaul there the next day. Upon completion of this work the ship resumed operations on 13 December when she began sea trials. Anchorage returned to San Diego on 15 January 1979. During the next eight months she was involved in post-overhaul maintenance and training. she operated along the southern California coast and held refresher training and amphibious refresher training. On 24 September the ship got underway to take part in Exercise "Kernel Potlatch II " a joint American- Canadian fleet exercise. Having concluded a successful amphibious landing on the northern coast of Vancouver Island she made a port call at Esquimalt British Columbia. After debarking marines at Camp Pendleton Anchorage returned to San Diego on 13 October. She participated in local operations and training exercises through the end of the year in preparation for an upcoming deployment in 1980. Four days into the new year Anchorage slipped her moorings and left San Diego bound for the exotic Orient. 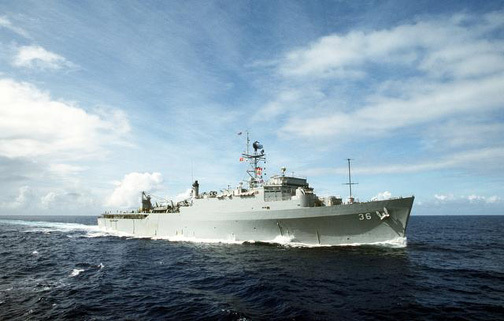 Along the way the dock landing ship visited Pearl Harbor Eniwetok Atoll in the Marshall Islands and Guam in the Mariana Islands before arriving at Subic Bay in the Philippines on 6 February 1980. Upon arrival she loaded a refurbished utility landing craft (LCU) for transportation to the Republic of Djibouti (former French Somaliland) located on the northeast coast of Africa near the Horn of Africa. The LCU -- dubbed Le Bac de la Paix (tr. the boat of peace) -- was a gift from the United States to Djibouti to enhance the country's inadequate commercial transportation system. Anchorage stood out of Subic Bay on 15 February to begin her goodwill mission. Steaming by way of Singapore she crossed the Indian Ocean and arrived in Djibouti on 3 March. The dock landing ship spent two days in Djibouti delivering America's gift and helping to cement relations between the two governments and peoples. From Djibouti she headed for Diego Garcia Island to deliver barges to that isolated American outpost in the middle of the Indian Ocean. The ship stopped at Diego Garcia from 12 to 15 March and then resumed her voyage back to the Philippines. She made a stop at Penang Malaysia along the way and reentered Subic Bay on 24 March. During the three months that remained of her 1980 deployment Anchorage carried out operations in surroundings more familiar to 7th Fleet ships than the Horn of Africa and the Indian Ocean. Early in April she visited Hong Kong before voyaging to Okinawa to embark Marine Corps units on the 17th and 18th. From Okinawa the dock landing ship sailed via Subic Bay and Singapore to Thailand where she joined elements of the Royal Thai Navy and the Royal Thai Marine Corps in amphibious training exercises. She concluded the interlude in Thai waters with a visit to Pattaya between 5 and 10 May. Anchorage returned to Subic Bay on 19 May and remained in port until near the end of the first week in June. On 6 June she got underway to return the embarked marines to their base on Okinawa. She stopped at Naha Okinawa from 10 to 12 June and then returned to sea for the voyage back to the United States. The trip home included a two-day stop at Pearl Harbor and ended back at San Diego on 3 July. After the usual month of relative inactivity following an overseas deployment Anchorage began west coast operations early in August with a courtesy visit to Seattle Wash. for the city's annual sea fair. Normal duties continued until late September when she returned to San Diego for a two-month availability. The dock landing ship completed repairs on 20 November and resumed operations out of her home port. Various training evolutions occupied her time through May and into June of 1981. On 23 June Anchorage stood out of San Diego on her way to duty with the 7th Fleet in the Far East. She stopped at Pearl Harbor at the beginning of July and remained in the Hawaiian Islands for the first three weeks of the month completing an oft-delayed propulsion plant certification. On the 22d she resumed her voyage west. The dock landing ship entered her first western Pacific port at Buckner Bay Okinawa on 3 August and embarked Marine Corps units for transportation to Yokosuka Japan. Throughout her assignment with the 7th Fleet Anchorage spent much of her time carrying marines between their bases and training exercises. In some cases the dock landing ship herself participated in the exercises; in others she simply provided transportation to the location of the exercise. Consequently she called at a number of ports in the Orient -- most frequently at ports in Okinawa Japan and Korea but also at Thai ports occasionally. Anchorage completed her last 7th Fleet mission at Naha Okinawa late in November and on the 21st got underway for the voyage back to California. En route she made an 11-day visit to Guam and a brief one-day pause at Pearl Harbor. She pulled into San Diego two days before Christmas. Post-deployment leave and upkeep carried her well into January of l982. After a brief period underway in the southern California operating area Anchorage began preparations at the end of January for regular overhaul at San Diego. The actual repair and modification work began on 1 March. Over the ensuing seven months the ship received general repairs and upgrading throughout as well as work on her propulsion plant modernization of her communications spaces and an enhancement of her defense capability against antiship missiles. Anchorage conducted sea trials in the local operating area during the first half of November and then spent the remainder of the year in port. The dock landing ship resumed operations out of San Diego early m 1983. In May she paid a courtesy visit to her namesake city Anchorage Alaska. Upon her return to San Diego in the middle of June Anchorage began a three-month availability in preparation for a deployment to the western Pacific scheduled to start in the middle of September. Except for a period underway between 22 and 31 August the dock landing ship was in San Diego continuously from 11 June to 12 September. On the latter day she slipped her moorings and stood out to sea on her way back to the Far East. The usual stop at Pearl Harbor lasted from 20 September to 2 October and then Anchorage resumed the voyage west. The dock landing ship arrived in Yokosuka Japan on 14 October. She spent the rest of October at Yokosuka then got underway for Okmawa on 1 November to begin conveying Marme Corps umts between their bases and the sites of training exercises. As in the past the dock landing ship participated in some but not all of the exercises to which she provided transportation for the marines. The deployment lasted through the end of 1983 and into the early months of 1984. She disembarked her last Marine Corps passengers at Yokosuka at the end of January l984 and remained there until the beginning of the second week in February. On the 8th Anchorage set out upon the first leg of the voyage back to the Umted States. On her way she made stops at Guam and at Pearl Harbor before ending the deployment at San Diego on 6 March l984. Except for a brief period underway inside the port on 17 April Anchorage remained moored at San Diego for almost five months performing repairs and modifications. Near the end of July she began sea trials out of San Diego that lasted mto the fourth week in August. On 23 August the dock landing ship made the brief passage from San Diego to her new home port Long Beach. Anchorage took about two weeks to get settled into her new base of operations and then embarked upon a series of training evolutions in the local operating area. Those drills and exercises -- punctuated by periods in port for upkeep and repairs -- occupied her time during the remaining months of l984 and for most of the first quarter of 1985. On 27 March 1985 she left Long Beach on a course for the Orient. The dock landing ship interrupted her long voyage briefly at Sasebo Japan on 16 April to pick up mail and then arrived at Pohang Korea on the 17th. At Pohang Anchorage embarked a Marine Corps contingent and set sail for Okinawa on 18 April. For the next four months she crisscrossed the distant reaches of the Pacific delivering marines to various points for combat training and returning them to their bases. On occasion she joined in the exercises herself to practice her role as an amphibious warship. Her final group of passengers came on board at Yokohama Japan between 9 and 11 August and disembarked at Buckner Bay Okinawa on the 14th. On the 15th Anchorage began the passage home. She stopped at Pearl Harbor from the 26th to the 28th and arrived in Del Mar Calif. on 3 September 1985. The following day the dock landing ship moved to Long Beach where she began a five- week post-deployment standdown. With her return to active operations on 10 October Anchorage embarked upon an extended period of local operations that occupied her not only during the balance of 1985 but for the whole of 1986 as well. As of the beginning of 1987 Anchorage was moored at Long Beach. Anchorage received one award of the Meritorious Unit Commendation and six battle stars for Vietnam service.